Résultat phare de la vente. French painter of portraits and landscapes. Neo-impressionist. Daughter of the botanist Gustave Camus. She studied in Paris with Robert-Fleury, Jules Lefebvre and Adolphe Déchenaud. 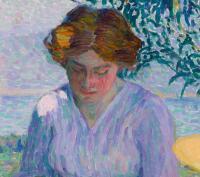 She mostly worked in southern France, where she befriended Henri Martin and Dunoyer de Segonzac. She regularly exhibited in Paris, at the Salon des Artistes Français between 1911 and 1939, and was awarded the gold medal in 1920. She also exhibited at the prestigious Bernheim-Jeune and Georges Petit galleries. She was made a Chevalier of the Légion d'honneur. 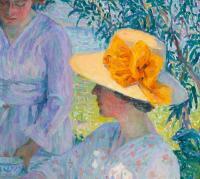 The museums in Besançon, Chalon-sur-Saon, Douai, Lyon and Nice have paintings by the artist.